Going to just jump straight in, and present my 312th version of my side to date. DEF: I'm seriously loving this backline. With the new kick in rules, the focus for 2019 is going to be in the backline. MID: It's probably my weakest line, but its solid. Libba can be swapped for Miles or Hanners depending on JLT. Rookies are placeholders for the timebeing. RUC: Sandiwitts worked for me, so this year its Grunsmith. FWD: It was so annoying that there wasn't a fallen premium in the $200k - $350k mark, but I'm happy with how it looks. 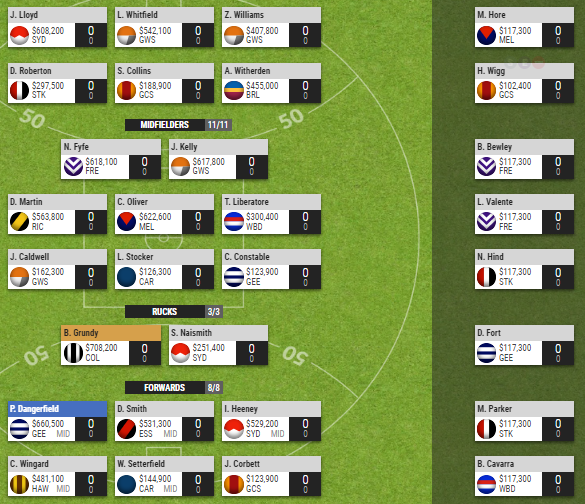 The four players that I keep toying with the most is Witherden, Libba, Naismith, Wingard and how those lines are best balanced. Anyway, I'd love to hear any and all of your thoughts and as always, happy Supercoaching! Slight change, all thanks to Michael Gibbons. I've been informed that he'll be priced at $102k and will be available in SC later this week. So for now, I've earmarked him with another $102k rookie. Liking this side, but not loving it. Still concerns around Naismith and the structure of the forward line. Honestly apart from Naismith i really like this. Pending rookies could maybe swap a def premo such as Whitfield for a fwd premo if needed. 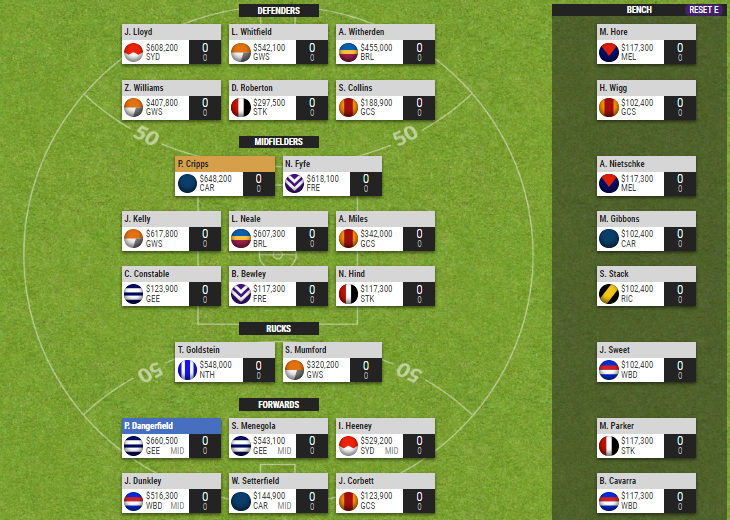 Don't mind the strategy, probably look at Mumford however, fitness pending of course. If Fort lines up can't see much going wrong. 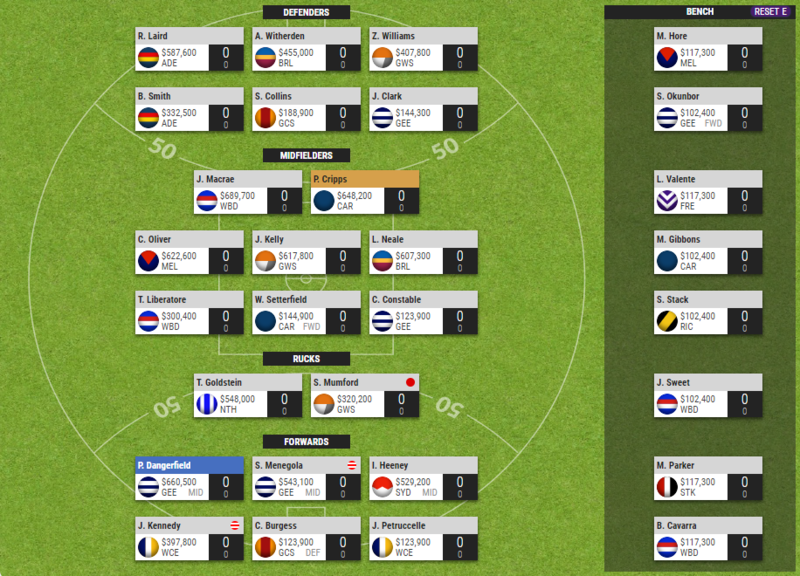 Like the strategy but I would try and find the money for Mumford who should come in round 2-3 (can’t remember) or English. Yeah, not sold on Naismith either, but that was the last position I had to pick. 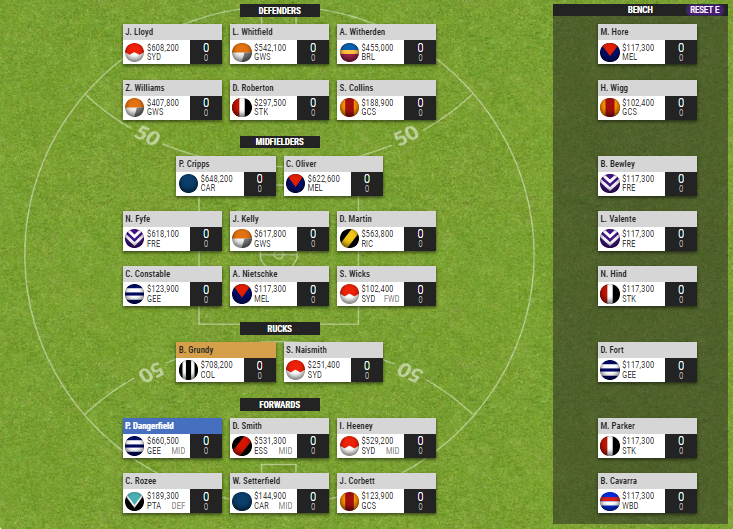 I could look at downgrading Roberton and Martin and using the cash, but the rest of the side looks too good to alter! I do like the Mumford option, it just rules you out of the overall standings. I've always put league first, but always wanted to do better in the overall standings....hard choice. If Fort does line up Round 1, it does make things interesting. Huge risk taking a rookie in at R2...I couldn't do it. If he's dropped, then what?! Only way I'd consider it would be to have Westhoff in the forward line as security, but I see him going backwards this year. Think I solved the Naismith issue. Do not like the idea of dropping Dusty who is underpriced but your decision. Also, Mumfords no help if you're chasing overall ranking. I know there is a strategy going around where people getting a $350-400k ruckman in for 2 rounds then trading Mumford in, but its a waste of a trade IMO; they are gold! I've decided to do a full 180 and backtrack on everything I said about Mumford. Yes, I'd love to chase the $50k, but bragging rights in league matches mean more. I've made another alteration, and this time I'm really happy. Backline: Has not and will not change. Locked. Rucks: Complete overhaul. Grundy and Naismith are OUT. News from today doesn't bode well for Grundy. So in their places, IN comes Mumford and Goldstein! Well there we go...the first week of the Ansett Cup done and dusted! This then means that I've changed my team exactly 11,342 times, but I've stopped, at least for the next 73.8 seconds, which should be a new record. Wait. Nope, start that clock again. So, this is where my team sits for now, its getting .....wait...yeah, that should for now. I'm liking the overall makeup, but I'm still trying to work out a preferred way to get Grundy into the side. Yeah...thats what I have been looking at. I'm just not settled on having three rookies on the field down forward.